I had decided my next destination would be Golden Bay in the north west of the south island. I had been inspired by Tamsin and her books to experient with cleansing, and Golden Bay, an enclave of alternative culture, organic food, and sandy beaches seemed an ideal place do do so. To get there I would need to travel up the west coast, but to the best of my ability I couldn’t find a bus going my way. I was going to have to hitch. I set out from Riverton the day after the Harvest Festival heading south towards Invercargill, where I would find the bigger roadways. My first ride turned out to be none other than the Guytons, on their way to a radio interview. They were able to drop me off where the road turned north, and about thirty minutes later I was picked up by a firendly old truck driver carrying two trailers of gravel. I got a few more rides on my way north to Queenstown and the west coast. There was a local butcher, a couple of travelers with a rental car, a friendly fire-sprinkler man by the name of Lindsay who took me over the mountains to Wanaka (stunning! ), Steve, a Reiki healer who was not in the least surprised to meet another energy man, Alex, a shirtless sunburned kiwi, and Pete, an adventure tour guide who was building his own home in Makarora. That was as far as I made it in one night, settling in to a little holiday park in Makarora, halfway between Wanaka and the west coast. The next morning it took me nearly an hour and a half to find a ride, but when I did, I found he was going all the way north to Nelson. Craig, a salesman from the UK working and travelling in NZ, picked me up. I rode with Craig for about four hours up the west coast past rugged beaches, dense bush, and glacial peaks. Dissapointingly, Craig didn’t seem too interested in stopping to see the sights, but I was happy to have the ride. Then suddenly, in Greymouth, Craig announced that he’d like to let me off, despite the fact that we had a shared road for a ways ahead. He said he was going to go get some KFC, but not five minutes later as I was walking to the highway I saw him drive past. I waved but his eyes never left the road. That angered me, but in retrospect I’m happy he let me off. I’m highly suspicous of anyone who fancies KFC anyways. 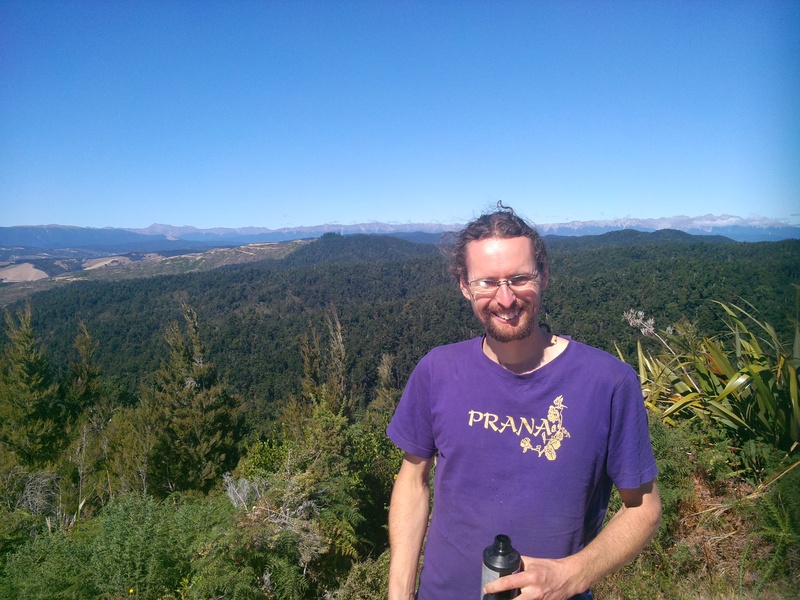 Outside of Greymouth I met Fabian, a drunk German traveller. I was a bit worried he would ruin my chances at a ride, but a local woman who owned a fabric shop picked us both up. The problem was, she could only take us about thirty minutes down the road, which turned out to be the middle of nowhere. Fabian and I were about to settle down for the night under the pole barn in a timber yard when we were picked up by a trucker (and former bee keeper) that took us to Reefton, the next township. Spending the night in the lockal backpackers, I headed out early and caught a ride with a local dairy farmer. We had a nice chat and he let me off where the road turned towards Nelson. From there, after a brief but shocking encounter with an electric cattle fence, I got picked up by a German mother and daughter for about twenty minutes. Let off on the side of the road in a mountainous gorge, I waited for my next ride. 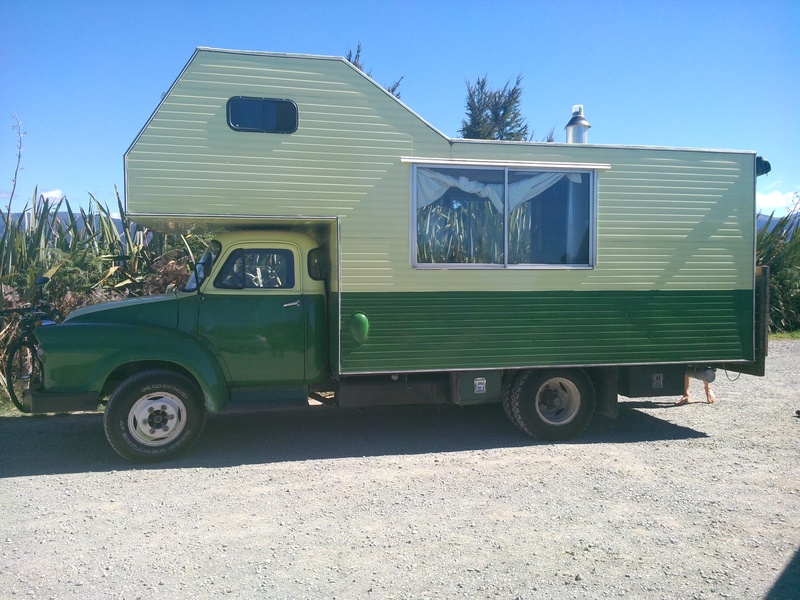 Grumbling down the road comes this old RV painted green and yellow and it slides up next to me. Out pops a barefoot man with a ponytail and a shirt that reads “Prana.” Without saying anything I knew he was headed to Golden Bay too. 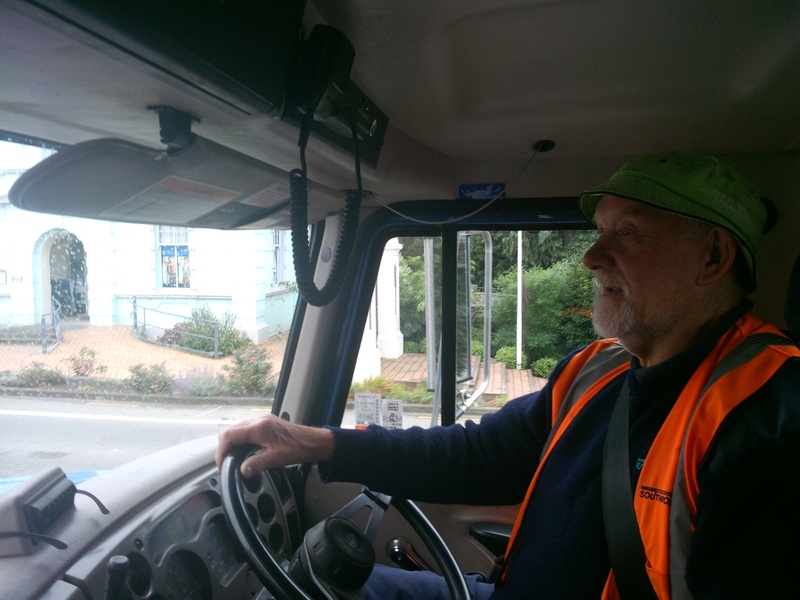 After helping him fill up on diesel (he was driving a 1963 tow truck that he had converted into a house) I hopped up into the front seat. Throughout the cab were scattered apples, bananas, a pumpkin, dried herbs, and, growing underneath my feet, rosemary and stinging nettles. They got me a few times. Along the way we stopped at a river to go swimming and then parked the truck in Marahau, right over the hill from golden bay. Mark made me a meal of raw vegtables, sprouted peanuts, kimchi, and a boiled potato topped with coconut oil, avocado, and an asian dressing. It was super tasty. Later on he started teaching me to play the guitar, an instrument I have always wanted to learn but never got around to. 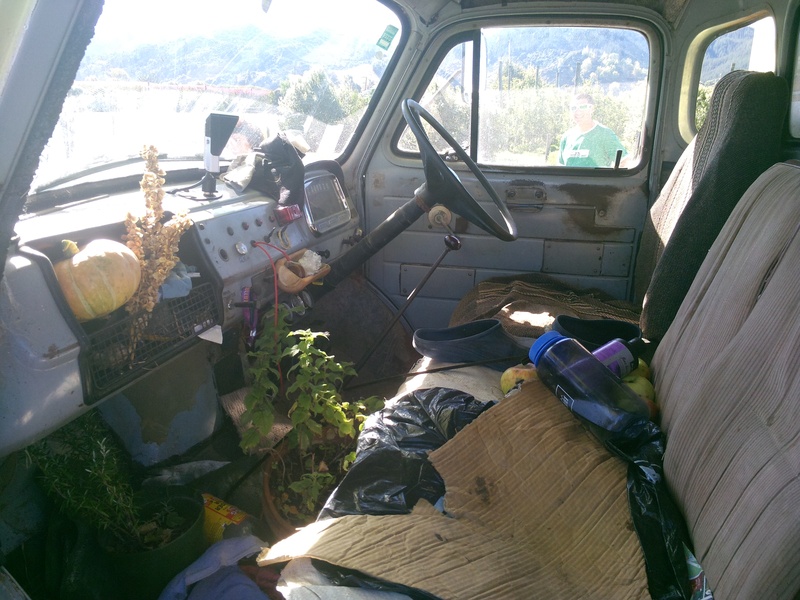 I camped in his truck under the full moon. I was thirlled to have had such a momentous encounter. The next morning we continued on to Golden Bay with one more stop at a sared Maori spring to fill up on water. By noon we had made it to Takaka, the bay’s central town. Mark let me off with plans to meet up later in the week and I went off to find a hostel. The map of the Park in the South was helpful. A map of your trip to Golden’s Bay would also be good. Thanks Win! How is everything? It must have been an awkward 4 hours with the KFC loving UK salesdude. I’m glad he let you off, though, cuz then you got to hang with Mark! He seems like your kinda homie. I’m going to make raw vegetables, sprouted peanuts, kimchi, and a boiled potato topped with coconut oil, avocado, and an asian dressing for lunch tomorrow. That sounds amazing. I forwarded the information you’d sent out re: your Qi-Gong teacher to my sis-in-law, who’s having various medical issues. Thank you. Thank you Nina! I hope everything is well and good in Ny. Great posts Obiwan – Sorry the English guy was a bit weird, looks like he kinda freaked out or something. Hope your adventure are progressing nicely and according to the grand plan! Thankfully I know some god English guys so it didn’t spoil the lot of. Them for me! Yes the adventure proceeds according to the grand plan, though maybe not always my plan! Miss you buddy.